Senegal have chosen Morocco as the host country for their 2014 World Cup play-off second leg against Ivory Coast. The Teranga Lions cannot play at their national stadium because they are banned from playing there after riots when the sides met in October 2012. Since the year-long ban came into effect, Senegal have played 'home' matches in Guinea and Morocco. And the Senegal Football Federation (SFA) decided on Tuesday to play the crunch qualifier in Casablanca. The game will be staged at Stade Mohamed V, a 67,000-capacity venue in the heart of the city. It is the home ground of Raja Casablanca and Wydad Casablanca and is also often used to host Morocco international matches. Africa's final round of qualification for next year's tournament in Brazil sees 10 teams involved in five two-legged ties to be played in October and November. 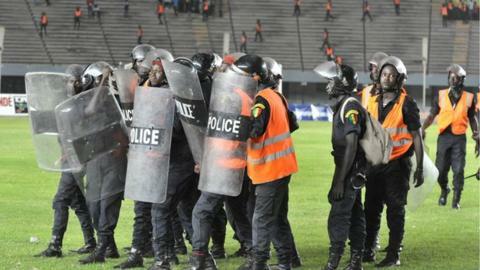 Senegal were banned from playing at Leopold Sedar Senghor stadium for one year after their fans rioted during the Africa Cup of Nations qualifier against Ivory Coast in Dakar, forcing the match to be abandoned with about 15 minutes to play. Ivory Coast were 2-0 up at the time and the result eventually stood with the Elephants claiming a 6-2 aggregate victory. SFA president Augustin Senghor told BBC Sport on Monday: "We do not have a stadium in Senegal with the facilities and capacity to play the qualifier against Ivory Coast. "We played our last 'home' matches in Morocco and Guinea and it is important for us to play our final qualification match in an environment we know very well." Senghor also gave his backing to coach Alain Giresse over the Frenchman's policy to select only players who are playing regular first-team football - a decision which has led to the omission of Chelsea striker Demba Ba. "The selection of players is the domain of the coach and in our way of working we let him have the responsibility for his choices," Senghor said. "We have players who are more motivated and every player that wants to be selected knows that they have to work hard for their club in order to come back. "It is up to every player to battle for his place in the national team."